Angular contact thrust ball bearings shown here were originally designed to support the rotary tables of drilling rigs but are also suitable for other applications where high load carrying capacity, high axial stiffness and low friction torque are important. 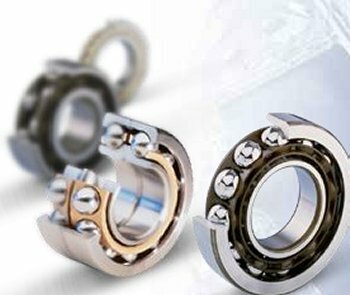 In contrast to conventional thrust ball bearings, angular contact thrust ball bearings can accommodate radial loads in addition to axial loads and are able to operate at high speeds. These are able to take up axial loads acting in one direction only. They are of separable type. The washers and ball and cage assembly can be mounted individually. In the main application, two bearings are adjusted against each other. The second bearing has to carry the weight of the drill when it is stationary and has a higher load carrying capacity than the first bearing. Here the upper bearing has the higher load carrying capacity and the smaller bearing in the opposite direction is combined with it to form a unit. These bearings have low height and can accommodate axial loads acting in both directions as well as moment loads. A single bearing can support rotating machine components in relation to stationary components.